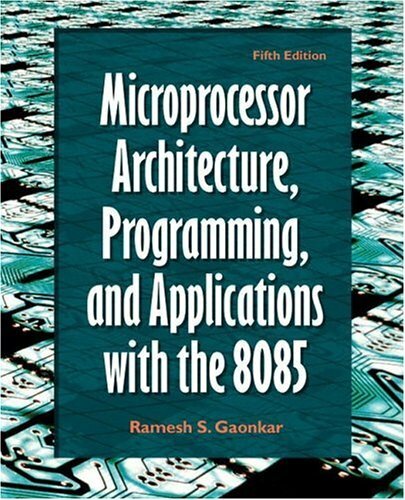 Microprocessor Architecture, Programming and Applications with the 8085 is a detailed guide that provides information on microprocessors, covering its hardware and software areas based on the 8085 Microprocessor family. The book was first published in 1984 by author Ramesh Gaonkar. The updated edition-5th edition-includes the most recent technological changes. Microprocessor Architecture, Programming and Applications With the 8085 focuses on 8085 microprocessor family to teach the basic concept of programmable devices. Providing explanations from fundamentals to applications, the book prepares the readers to apply various concepts in their jobs related to microprocessors. The book is divided into three parts. The first part is called Microprocessor Based Systems: Hardware and Interfacing. This part covers the topics Microprocessors, Microcomputer and Assembly Language, Introduction to 8085 Assembly Language Programming, Microprocessor Architecture and Microcomputer Systems, 8085 Microprocessor Architecture and Memory Interfacing and Interfacing I/O Devices. Part two is called Programming the 8085.